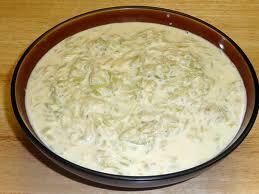 Add water-soaked rice in the boiling milk. Mix sugar according to your taste. Cook on medium flame and stir continuously. Slow & steady stirring is essential to avoid sticking. In about 12-15 minutes kheer will become thick. Now add some nuts according to your choice. Serve hot or cold according to your preference. Boil milk and add sugar to it, mix well.Now add poha/ atukulu to this milk . 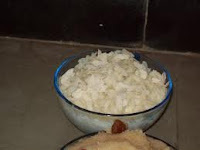 Here is y paala atukulu / beaten rice with milk / Doodh poha waht ever you call it as.